The Syrian government is ready to negotiate a ceasefire agreement with opposition forces in the flashpoint city of Aleppo, Foreign Minister Walid Moallem has said. A list of rebel prisoners has also been drawn up in preparation for a proposed exchange. Damascus has handed Moscow a plan for a ceasefire in the city of Aleppo, Moallem announced at a news conference with his Russian counterpart, Sergey Lavrov, in Moscow on Friday. “Taking into account the role of the Russian Federation in halting the bloodshed in Syria and our relationship of trust, today I have given Minister Lavrov a ceasefire plan for the city of Aleppo,” he said. Moallem asked Lavrov to coordinate with his contacts in the Syrian opposition in order to ensure the execution of the new plan, adding that if it is successful it could be implemented in other areas of the war-torn country. Moallem asked Lavrov to coordinate with his contacts in the Syria opposition in order to ensure the successful execution of the new plan. Addressing the issue of the humanitarian crisis in Syria, Moallem said the Syrian government is already working with the UN to deliver aid to “a number of regions.” However, the success of the humanitarian program depends on rebel fighters keeping to their pledge not to open fire on humanitarian convoys, he said. The UN estimates that over 100,000 people have died since the violence broke out three years ago. 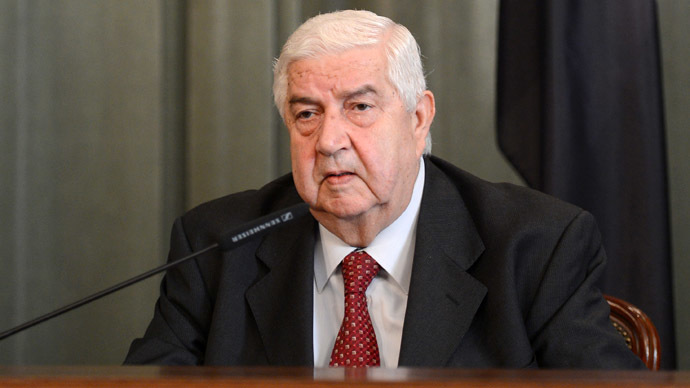 Refuting claims the Syrian Army is bombing its own citizens, Moallem said that such allegations “do not reflect the reality of the current situation.” He laid the blame at the feet of terrorist organizations that are being supported by international players. Both foreign ministers said that opposition representation is absolutely essential for the success of the Geneva-2 talks, which are set to kick off next Monday. They believe the conference will pave the way for the creation of a transitional government to bring an end to the three-year conflict. The Syrian National Coordination Committee, a faction in the domestic Syrian political opposition, decided to boycott this month’s peace conference in Switzerland, UN envoy to Syria Lakhdar Brahimi has said. The Syrian National Coalition – the main political opposition group – is meeting in Istanbul on Friday to decide whether it will attend the Geneva talks.